Gala Pa More! : Harlequin Theater Guild's "Kabilang Ibayo" Is A Cultural Excursion That Should Not Be Missed! 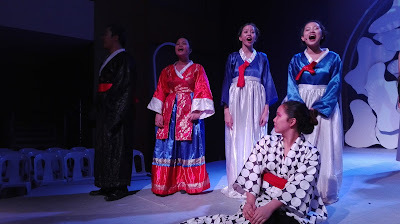 Harlequin Theater Guild's "Kabilang Ibayo" Is A Cultural Excursion That Should Not Be Missed! "Kabilang ibayo man ang pagitan, hindi ito hadlang sa patutunguhan." So goes the line from a song in "Kabilang Ibayo", a play composed of three acts written by Palanca Hall of Fame Awardee, Sir Nick Pichay. 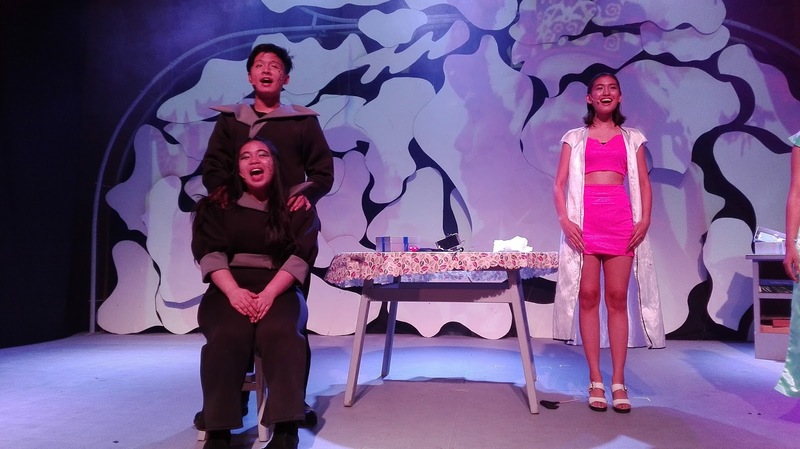 Directed by Sir Raffy Tejada and performed by DLSU Harlequin Theater Guild, "Kabilang Ibayo" tackles various cultural issues in a rather entertaining and poignant way. The venue almost exploded from the boisterous laughters of the audience! The cast of "Mystery Land"
People from various countries in Asia line up for the auditions as performers in Mystery Land, a fictional amusement park in the United States of America similar to Disney Land. 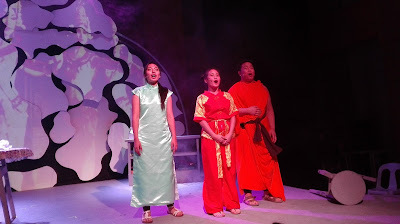 “Mystery Land” is a musical that talks about the extent of what people would do just to fulfill their “American Dream”. It highlights the commoditization of labor, as well as losing one’s cultural identity, just to fit in the standards of America. This is a story of the two scientists who invented a “Filipina” robot with “malfunctioning program”, but who, surprisingly, could follow instructions using a language different from its inventors. Indeed, there is no superior language. Thus, it is unnecessary to force one’s language to others, as they can function properly using their own. A hilarious play featuring three old Korean women, one of which was about to marry (for the first time) an equally old man whom she had met only a few months’ back! One the wedding day, one of the women revealed that she was a comfort woman during the Japanese Occupation, and was abused by a Korean soldier serving Japan. It was exposed that the old man was a Korean soldier serving Japan in the past and it’s possible that he was the one who raped her. The play emphasizes that it is not easy to let go of the past and forget the history. There was, however, a happy revelation at the end. Priced at only Php 250, this production that runs for 2.5 hours is really worth the money (and the effort of braving the traffic just to get to La Salle!) Watching "Kabilang Ibayo" is a cultural excursion that you would want to experience over and over again. 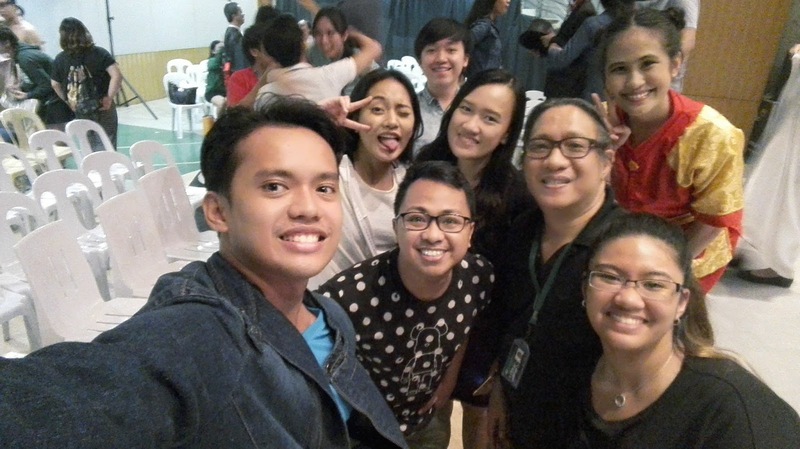 If there's one thing that "Kabilang Ibayo" promises you, it's that you would go home smiling.